Before there was such a thing as online time tracking software, I was already obsessed with tracking my time. I’d worked in creative agencies, web design agencies, web development shops, software development companies, and even dabbled in IT. Regardless of my role at each job, I wanted to know how much time I was working, and on what. 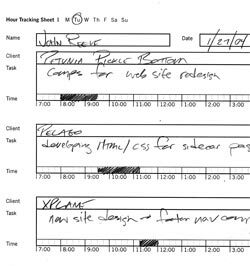 Today we are fortunate to have Web-based software, like Intervals, that does a much better job tracking my time then I ever could with a pencil and a sheet of paper. I decided to revisit the three different analog methods I’ve used in the past for tracking my time &mdash; an exercise mostly in nostalgia, but also to see how much Web-based applications have improved our time tracking efforts . 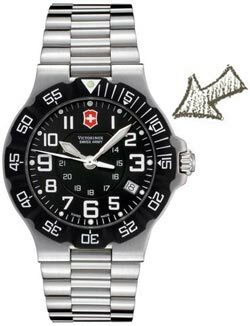 My favorite type of analog watch was always one that had the seconds stamped on the outer ring. You could turn the outer ring to any position to mark the time. When starting a task I would turn the outer ring so the ‘0’ would line up with the minute hand. When I was finished my watch would show me how much time had passed. If time went over an hour I would have to keep track of those hours in my head, but for tracking the minutes it worked great. Another benefit was that I always had my watch on my wrist, so I could track time at my desk and in the field. In the end, a watch’s portability was no match for today’s time tracking apps that work intuitively on our desktops, laptops, tablets and mobile devices. Regardless of how I tracked my time I still needed to record it. A pencil and notepad fit the bill. It was portable, had plenty of pages, and had ruled lines. My personal preference was for spiral bound notepads. It was up to me how I formatted my time entries, giving me complete autonomy over my time tracking efforts. However, it also gave me a complete lack of structure. How would I organize the time entries? How would I tally them up for billing? What if I lost my notepad? The notepad method was never ideal and left me wanting for something better, but it worked and it got the job done. I do still keep a spiral bound notepad on my desk, but you won’t find any time entries in it. Tracking time on a sheet of paper designed and printed to actually be a timesheet was a big step forward. 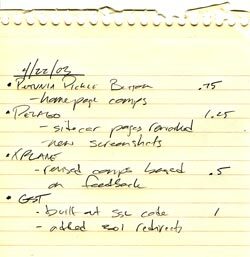 There were designated boxes on the page to jot down the date, client name, description of work, and the number of hours and minutes. We took it one step further by designing a timesheet that included boxes you could ‘bubble in’ to mark how much time was tracked. It was a big step forward because it made it really easy to track time throughout the day, instead of having to remember everything you did at the end of the day. But when it came time to actually do something with the data &mdash; run reports, bill clients, measure productivity &mdash; it took hours to manually enter timesheets into Excel. We jumped on the idea of designing and developing our own Web-based time tracking application. The time spent developing it would be time invested, not wasted. And the application itself would one day evolve into Intervals, our online time, task and project management software used by small businesses throughout the world. Pen and paper would work for the short run, I mean we all done right? But due to the new iPhones and Android phones it’s easy to keep track of time anywhere you like. Yes, as do we. In fact, we created our own time tracking tool, Intervals, as mentioned in the article. But it’s always a good exercise to look back on our roots to see where we came from, and just how far we’ve come. The Internet has made time tracking much easier and more mobile than ever.